We saw this recipe a while ago, and have been looking forward to making a vegan version of it. What a delicious meal this was! It’s very easy to make and adapt to being vegan. It merely took replacing the butter with vegan margarine, the sour cream was replaced with soy cream and using vegan Parmesan. I made my own from almond meal, nutritional yeast, a bit of salt and dry mustard powder. The crust is quite rich, using 8 tablespoons of butter/vegan margarine. If you have a favorite flaky pie crust, I’m sure you could use that recipe as well. Oh, and of course, we did not make an egg wash on the crust. We did not put any wash on it, but if you wanted, you could brush the crust with some more soy cream. It’s the great combination of Brussels sprouts with the grapes, a bit of vegan Parmesan and the balsamic vinegar. We will be enjoying this recipe again. 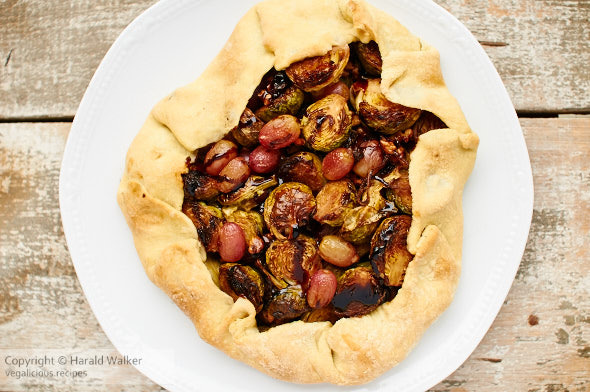 Posted by Chris Walker on December 7, 2012 in Brussels sprouts, Grapes, Reviews.